A new species of extinct sea monster from the Early Jurassic has been identified by a team of German and Swedish researchers. The fossilized bones were found in a clay pit near the city of Bielefeld in Germany. The findings will be published in the journal Alcheringa. The fossilized bones of a plesiosaur, an extinct long-necked marine reptile from the Age of Dinosaurs, have been identified by paleontologists from the Naturkunde-Museum Bielefeld in Germany and Uppsala University in Sweden. The remains are about 190 million years old and were excavated in the early 1980s. The new find was named Arminisaurus schuberti after the ancient Germanic chieftain Arminius, who defeated the Roman legions at Teutoburg Forest near Bielefeld in 9 AD, and Siegfried Schubert, the amateur paleontologist who secured the specimen for scientific study. 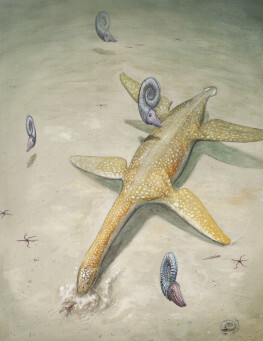 Another extinct sea reptile from Germany was named by the same research team only last month. “Plesiosaurs were amongst the most successful marine predators from the Age of Dinosaurs. Some, such as the famous Liopleurodon, were colossal predators up to 15 metres long. They were the equivalent of White sharks and Killer whales in the oceans today” said Sven Sachs, a researcher at the Naturkunde-Museum Bielefeld and author on the study. By comparison, Arminisaurus was small, only about 3-4 metres long, and probably hunted fish, squid and other small prey in the ancient seas that covered Germany during the Jurassic period. The preserved bones of Arminisaurus were broken up by mining machinery, but enough was recovered to classify the animal as an early relative of later Jurassic plesiosaur super predators known as pliosaurids. About 40 percent of the skeleton was recovered, including parts of the skull, vertebrae and limb bones. “Arminisaurus is significant because it dates from a timeframe early in the Jurassic, during which we have very few identifiable plesiosaur fossils” said Benjamin Kear, Curator of Vertebrate Palaeontology at the Museum of Evolution at Uppsala University, and author on the study. “Only two other plesiosaur fossils have ever been named from this mysterious interval in plesiosaurian evolution, making Arminisaurus a very important new addition for the global record of the group”. The study also showed that Arminisaurus shared features with plesiosaurs that lived 50 million years later, during the Cretaceous period. This information will help unravel the radiation of these bizarre marine reptiles, and shed light on the early diversity of the gigantic pliosaurids. The paper describing Arminisaurus is published in a forthcoming special issue of the Australasian palaeontology journal Alcheringa, which showcases some of the latest research on ancient marine reptiles. The skeleton will be put on display as a centerpiece in the Naturkunde-Museum Bielefeld in Bielefeld, Germany. Sachs, S. & Kear, B.P. (2017): A rare new Pliensbachian plesiosaurian from the Amaltheenton Formation of Bielefeld in northwestern Germany. Alcheringa DOI:10.1080/03115518.2017.1367419.